Play pretend with this wallet of 100 notes including $5, $10, $20, $50 and $100 notes. 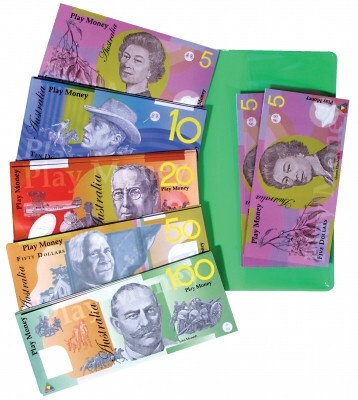 Made of rip resistant plastic, depictions of historical and security information found on real money are accurately replicated on the play money, helping children to identify and recognise Australian notes and teach them to understand their value. Images on these notes also match our Double-Sided Magentic Money (click to view).